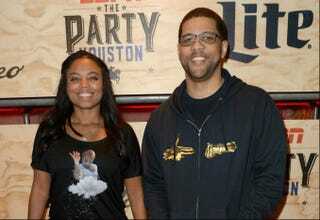 Even if you aren’t the biggest sports fan, you may have heard of Michael Smith and Jemele Hill. His & Hers, which began as a podcast conceived and hosted by Smith and Hill, proved so popular that in 2014 it replaced the ESPN2 show Numbers Never Lie, which Smith began co-hosting with Charissa Thompson in 2011. Since then the duo have scored with many nonsports bits, like their spoofs of Empire, Anchorman and Boyz n the Hood, as well as relationship debates like whether women who reach for their wallets ever really intend to pay on dates. And while Hill and Smith have individual sports acumen that is undeniable, it’s hard to ignore that their status as a male-female duo makes them all the more formidable. Even as sports broadcasting has actively beefed up its female ranks, the relationship that Hill and Smith enjoy is extremely rare. And now ESPN is rewarding that uniqueness with its ultimate prize: the 6 p.m. SportsCenter slot. It’s more than meaningful. It’s also historic. Hill and Smith’s SportsCenter takeover is the first for a black sports duo. Of course, individual black SportsCenter anchors in the 6 p.m. slot have not been an anomaly. In the early 1990s, Robin Roberts, who joined ESPN in 1990 and enjoyed a 15-year career there, became the first black woman to co-anchor the coveted SportsCenter slot. But the transition for Hill and Smith is noteworthy in that they both initially chose print as their primary medium and enjoyed successful stints at prominent papers like the Detroit Free Press and Orlando Sentinel for Hill and the Boston Globe for Smith, at a time when black sports professionals were much rarer. That shared background, however, is largely responsible for their personal and professional chemistry. “Jemele and I may be on the younger side [Editor’s note: Hill is 41, Smith is 37] relative to some of our colleagues at ESPN, but we’re dinosaurs in that we came up through the newspaper age, where it was like, either you were on newspaper and radio, where there was damn near no black people, or on television, which had mostly black people that were former athletes,” says Smith, a New Orleans native. SportsCenter may look a little different, with its updated look, but it plays no significant role in Smith and Hill’s grand scheme of making it uniquely their own. Instead, the pair promise that they are not deviating far from what has brought them to the dance in the first place. “We make [SportsCenter] ours the same way we did His & Hers—just by being our unapologetic selves,” vows Hill. “Throughout this entire process and our journey together, the one principle Mike and I have always stuck to is: No matter what, we’re going to go down swinging as ourselves. We’re not going to sit there and use somebody else’s idea of what television is. Both of them are very much aware that their “be us” approach and ESPN’s embracing of it owe a lot to legendary SportsCenter anchor Stuart Scott, who brought hip-hop culture to the center of the network’s sports coverage long before losing his battle with cancer in 2015. Still, that “brand of me” doesn’t work on everyone. “There are people from a viewership standpoint that’s just never going to feel us. We’re not going to be certain people’s cup of tea because they are not even willing to taste it, and that’s fine,” says Smith.